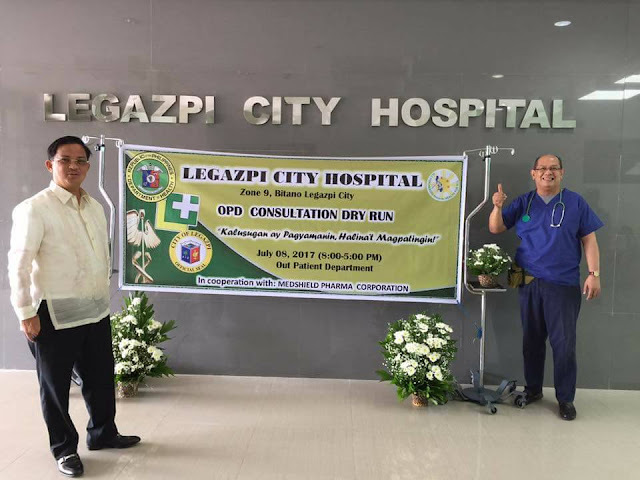 LEGAZPI CITY (July 13) - “Legazpi City Hospital is not yet ready”, said Dr. Jose Relacion in an interview by DZGB News over “Tingog kan Banwaan” program in DZGB-AM, Thursday. He made the clarification to correct the wrong public perception that it is now open when they conducted a dry run for Out Patient Department (OPD) in July 8 to test how to control the inflow of patients and determine if their planned strategies will be feasible once the health facility formally open. Dr. Legacion said that during the dry run there were 99 selected patients for medical, surgical and dental services from Barangays Bitano and Kapantawan. He further said that the dry run aims to determine if OPD will be acceptable to the people and to see to it that the state of the art health facility will not be overcrowded with patients inside while doing consultations. He said that there are final finishing touches that has to be done and some repairs for the felt need of the facility. “Mayor Noel Rosal will contact technicians from Manila accredited by the World Medical Relief Inc. (WMR) to test the medical equipments donated by the group if it is functioning and needs calibration for the operation of the city hospital, Dr. Legacion added. It may be recalled that Mayor Rosal had acquired a P43 million worth of medical supplies and equipment from WMR based in Michigan, USA. Rosal cited the city hospital as a state-of-the-art public hospital which will be one of the most modern public health facilities to serve the medical needs of patients in Albay and in the region. The Legazpi City Hospital, classified as level one hospital will have medical equipments including a dialysis machine that can be availed at lower rates. It can also offer medical services to less serious cases, simple surgical operations and emergency treatment among others, Dr. Legacion said.